Mount St. Helens in view over downtown Portland and the Willamette River during a ride on the Portland Aerial Tram. Photo by Brian Armada. 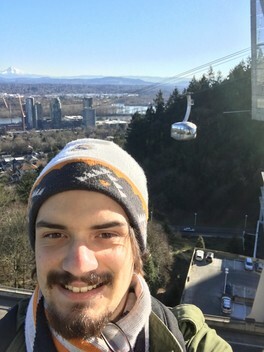 Despite being in Portland for the better part of four years, it is to my shame that I had never taken the Aerial Tram! 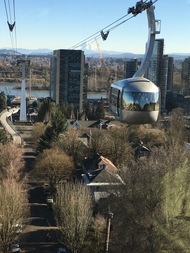 I had definitely seen it every time that I ventured into the South Waterfront, taking its commuters 500 feet into the air as it traverses 3,300 feet towards OHSU, but never once took it myself. That was the case until a few weeks ago when I took the aerial commute to OHSU accompanied by Rich Eisenhauer, PBOT’s SDC Program and Portland Aerial Tram Manager. Rich explained that the Aerial Tram is one of only two commuter aerial trams in the United States, the other being in New York City’s Roosevelt Island. Portland’s Tram is owned by the Portland Bureau of Transportation and operated in partnership with OHSU. 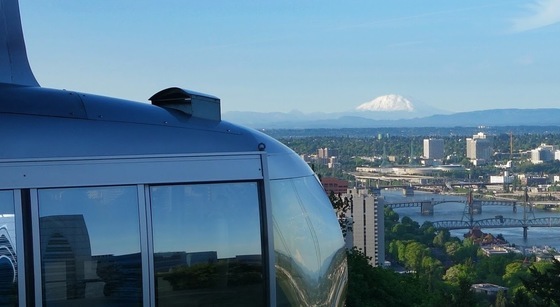 I got on the Aerial Tram at the South Waterfront terminal and was surprised by how spacious the Tram itself was – even with all the people inside, it felt very comfortable. The windows inside are huge and offer amazing views from every angle. The tram started moving slowly and smoothly at first, but gradually increased its speed. As I ascended, the tram itself was very steady and the ride felt like the climb right before a rollercoaster drop. Once I could see the OHSU terminal clearly, I felt the need to pop my ears! I got off the tram at OHSU and walked over to the observation deck, to take a couple pictures and I could not believe the view. The day was very clear and I was able to see Mount Hood, Mount St. Helens and Mount Tabor, along with downtown Portland and the South Waterfront. At the observation deck there’s a plaque that has a picture of Portland from 100 years ago and one of contemporary Portland – it was stunning to look down at that and see how the city has changed and then look back at the city and see how it is still changing. The ride down from OHSU to the South Waterfront is much more fun, the Tram accelerates slightly as it descends and the drop at the terminal is a very satisfying payoff. The whole way down I could see Mount Hood right in between the South Waterfront’s towering structures. I could definitely get used to this as a daily commute! I also learned that the Tram carries over 9,000 riders a day and sometimes even more during inclement weather. Rich from PBOT explained that although people may think the Tram is susceptible to snowy conditions “these things were made for traversing the alps!” and are considerably resilient. The Tram’s 10-year anniversary is coming up and I can certainly see the need to celebrate the service it provides - I’m just looking for excuses to take it again! Brian Armada is a senior studying economics at Reed College in Southeast Portland. CELEBRATE TEN YEARS OF THE TRAM! Saturday, January 28, 2017, 10 a.m. to 3 p.m. The Portland Aerial Tram is hosting a special Community and Family Day to celebrate ten years of service. Activities for the kids, historical displays, presentations on the construction of the Tram and the future of South Waterfront, samples from local restaurants and more. We'll also have guided walks, expert talks and special Tram Anniversary memorabilia. Join us for this once-in-a-decade event! The Tram runs 9:00 am to 5:00 pm; Children 6 and under can ride the Tram free with an adult.